TWIN BRIDGES – Twin Bridges storm water, sidewalk and curb plans were front and center again at the town council’s Tuesday, April 9 meeting. TWIN BRIDGES -- Twin Bridges High School student Mhanon Sullivan recently received second place honors in the Montana Teenpreneur Roundup. TWIN BRIDGES – A number of property owners came to the Twin Bridges town council meeting on Tuesday, March 12, to express their displeasure with plans to move ahead with part of a $600,000 storm water, sidewalk, curb and gutter project, scheduled to begin this summer. BUTTE—All eyes were on Great Falls two weekends ago for the state tournament of Class C girls, as Box Elder pulled out a six-point victory over Roy-Winifred 48 - 42 to claim their second straight state title. MADISON COUNTY – There’s only one more weekend of regular-season play before high school basketball enters championship games. But the only mainstay of local teams seems to be the Twin Bridges boys, who just continue rolling toward what promises to be an exciting post-season. 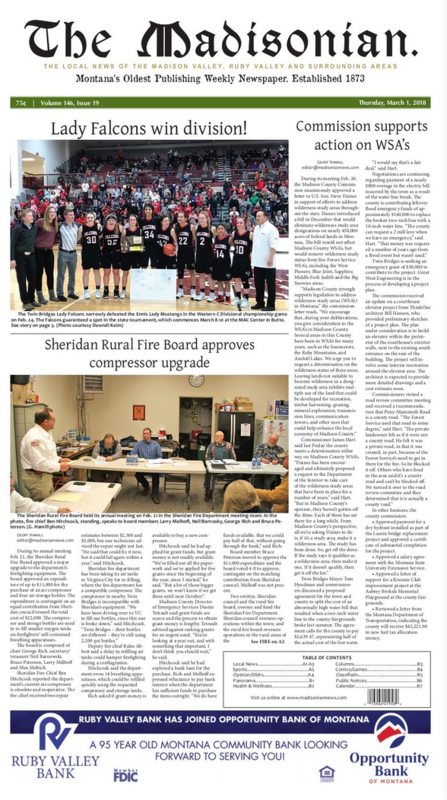 TWIN BRIDGES – Two possibilities for joining cooperatives and computer services dominated the discussion at Twin Bridges school board’s November 20 meeting. MADISON COUNTY—Butte-based nonprofit Headwaters Resource Conservation and Development hosted its annual Local Tastes dinner and fundraiser on Thursday, October 18, where it recognized businesses from around southwestern Montana in nine different categories. TWIN BRIDGES - For members of Montana’s cycling community, RATPOD is a well-known event, and a goal for many. This year the event—which stands for Riding Around The Pioneers in One Day—added a second ride to their annual fundraiser. TWIN BRIDGES – The fence between Four Rivers Fishing Company, owned by Chris Knott and Seth McLean, and Jeff and Patti Walker’s property was again an issue at Twin Bridges town council meeting on Tuesday evening, June 12.